Google has unveiled its latest Nexus smartphones as it tries to bite into the dominance of Apple and Samsung.The 5X and 6P will run Google’s latest version of the Android operating system, Marshmallow, which the company claims has improved battery life on devices by up to 30%. The 6P, made by Chinese firm Huawei, is the larger of the two devices and has a 5.7-inch ultra high definition screen as well as the first Nexus with an all-metal body. At a news conference in San Francisco, the company also claims the 6P has the best-ever camera in a Nexus phone. It is on the back and has a 12.3-megapixel Sony sensor, which Google says allows it to take better photos in low light. The megapixel figure is larger than on most other smartphones, including the iPhone. There is also an 8-megapixel camera on the front, as well as a fingerprint scanner on the back to open the phone and to make payments. It also has a USB Type-C port for fast charging. Meanwhile, the plastic-clad 5X, made by LG, is an update to the “much loved” and “iconic” Nexus 5 released in 2013, said Google’s Dave Burke. It has a 5.2-inch HD screen and also a USB Type-C port as well as a fingerprint scanner on the rear. It also has a 12.3-megapixel camera on the back but a less powerful 5-megapixel front-facing camera, compared to the 6P. There is also a new DOZE state which automatically shuts down more processes to extend the battery life. 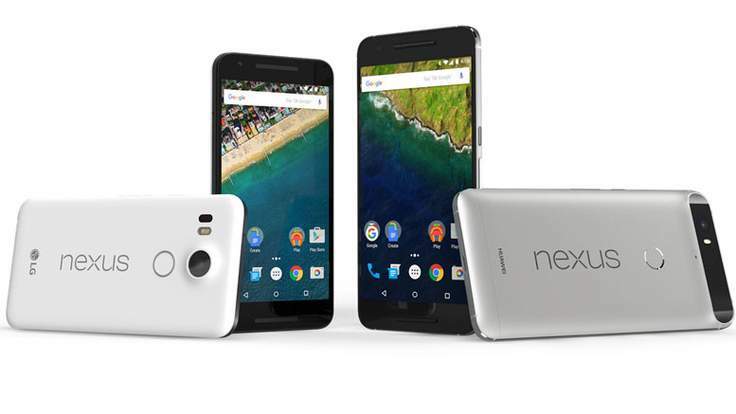 The 5X will start at £339 while the 6P will start at £449, with pre-orders beginning on Tuesday, Google confirmed. Google also unveiled the first tablet it has built itself called the Pixel C, which comes with a full-sized keyboard. The US technology giant also confirmed a new version of its Chromecast streaming device, as well as a new version that plugs into home stereo systems called Chromecast Audio. This will enable users to stream music from a mobile device through their home speakers.